Allan Donnelly » Forever, At Last. Mainstream messaging places traditional ads into gay media outlets and and uses one message to reach both gay and straight consumer segments. The control advertisement was taken from a 2011 copy of a bridal magazine. The publication gives some indication that consumers targeted by this ad are women who dream of marriage. The messaging of the advertisement plays off of a cultural paradigm that only one true love exists in the world for every person. The message coupled with the image of an anonymous man holding a Tiffany box transfers the association of one true love from a person to the brand. This advertisement is telling women that the only brand worthy of true love is Tiffany. Cryptic messaging uses language with a dual meaning that can be processed differently by gay and straight consumers. The cryptic advertisement was designed to target three different audiences: straight women, gay men, and lesbians. The message was crafted to hold two distinct message. The first reading of the message, as read by straight female consumers, connects the Tiffany brand with associations of longevity and marriage. The second reading of the message, as read by gay and lesbian consumers, connects the Tiffany brand to the marriage equality movement. The associations with longevity and marriage are still apparent, but for gay and lesbian consumers an added association of finality and justice is created, potentially arousing very strong, positive attitudes. Gay oriented messaging openly targets the gay community using language associated with gay culture. This type of messaging could alienate gay and non-gay consumers who do not wish to openly identify with gay issues. The gay oriented message was designed to specifically target gay and lesbian consumers. The message uses language and associations from gay culture. The first such association is a reference to coming out of the closet, that time when gay men and women tell their friends and family members that they are gay. The second cultural association is a reference to a rainbow, a popular symbol of LGBT pride. By creating linkages between the Tiffany brand and explicit symbols of gay culture, Tiffany uses its signature color to illustrate its support for LGBT issues. The surveys were designed to test two hypotheses. The first hypothesis was that reactions of straight respondents would be unchanged to the cryptic ad versus the control ad, while gay males will have a more positive reaction to the cryptic ad as compared to the control ad. This hypothesis is essentially testing whether cryptic messaging actually works, with gay and straight consumers reading different positive messages from the advertisements. The second hypothesis was that both gay males and straight consumers would have an adverse reaction to gay oriented messages when compared with the control ad. This hypothesis derived from the assumption that overtly gay-oriented messages would turn straight consumers off and alienate gay consumers. The advertisements were built into consumer surveys that asked respondents to rate their attitudes and associations in response to each ad. The ordering of the test images was randomized so as to minimize errors due to respondent assumptions about testing order. Respondents were asked to rate their attitudes toward each of the advertisements using a five point Likert scale (strongly disagree to strongly agree). Respondents were asked how much they agree of disagree with statements like: This ad make me feel uncomfortable; This ad is targeted at me; This ad positively changes my perception of the brand; This ad increases my likelihood to purchase from this company. A total of 123 surveys were completed. Demographic information was collected regarding the respondents’ sexual orientation. The majority of respondents were straight while about one fifth of respondents identified as gay. 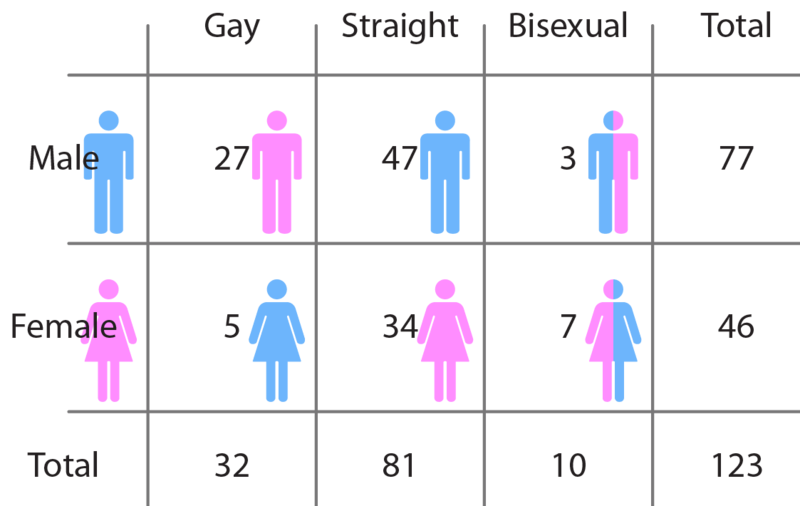 Of the gay respondents, 27 were male and 5 were female. Ten respondents identified as bisexual. A total of 77 males and 46 females completed the survey. 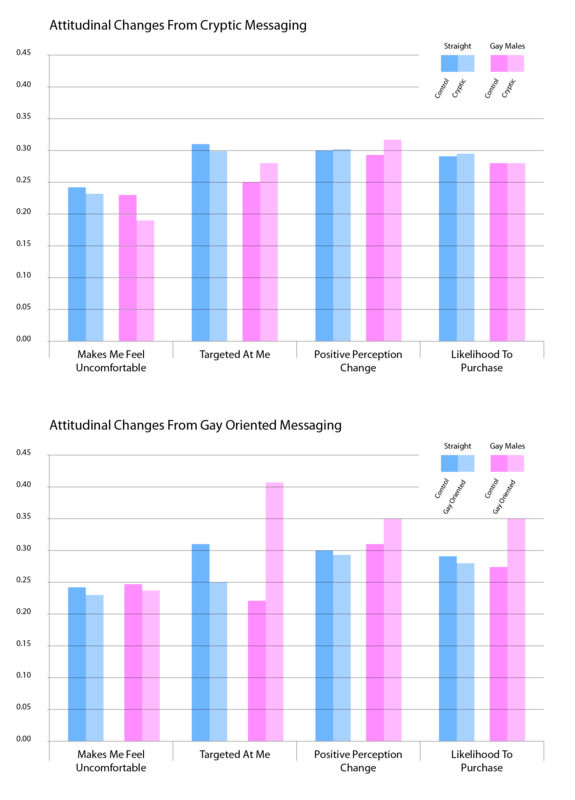 To measure the results of the survey, the set of responses for both the cryptic ad and the gay-oriented ad were tested for significance against the control ad. The findings demonstrate that cryptic messaging can be an effective way to use a single message to target both gay and straight consumers, accepting hypothesis one. The research also shows that both gay and straight respondents had an increase positive association with the brand after seeing the gay-oriented message. The gay oriented message made both groups feel slightly less comfortable and had something of a polarizing effect for the two groups on the other metrics. Gays felt that this ad was more targeted at them and had a positive change in perception about the brand, while straight respondents felt the ad was not targeted at them and had a slightly lowered change in perception. This finding rejects hypothesis two. The caveat for marketers, however, is seen when looking at the likelihood to purchase metrics. The cryptic message did not increase likelihood to buy attitudes in gay respondents. Though it did not lower those attitudes either. With the gay-oriented message, however, likelihood to purchase for gay consumers exploded while receding a bit for straight consumers. This works shows that both cryptic and gay oriented messages can increase brand associations of the gay consumers. But cryptic messages are better for universal advertisements, while gay-oriented messages might be most effective when used in gay media channels.